I had a fantastic time last week when Air Asia launched its inaugural flights to new summer destinations from Davao to Cebu, Puerto Princesa, Caticlan and Clark. I was blessed to be part of the group of bloggers, vloggers, and journalists who went to Cebu for a 3-day Familiarization Tour! Yes three whole days to explore the beauty of the queen city of the south that is Cebu. Although I have been to Cebu a few times, I have not experienced a planned trip with extensive itineraries that would take us to historical and gastronomical places in this part of the Philippines. On our first day, after we landed at Mactan Airport, and after the inaugural ceremonies of the maiden flights. Galleon San Pedro Tours led by the seasoned guide Ka Bino Guerrero took us to a Heritage Tour to Cebu City's popular historical sites. Our first stop? The Magellan's Cross along Magallanes St fronting the City Hall. 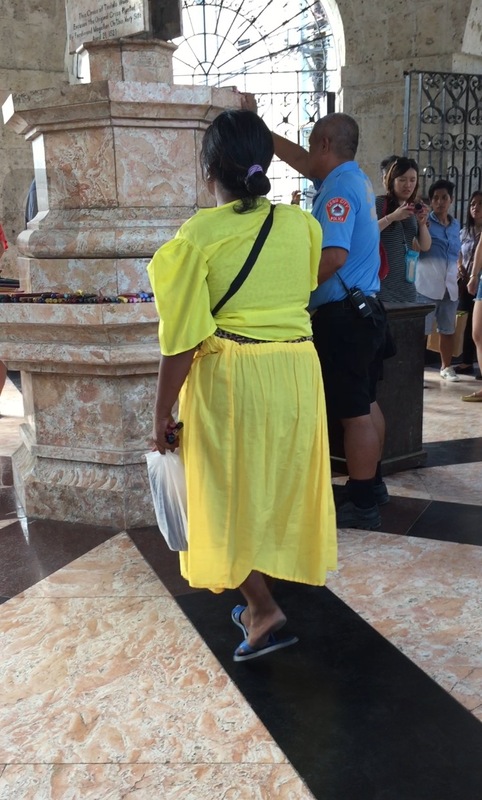 It is the famous Christian cross planted by Portuguese and Spanish explorers as ordered by Ferdinand Magellan upon arriving in Cebu in the Philippines on 15 March 1521. It is very near the Basilica del Santo Nino. 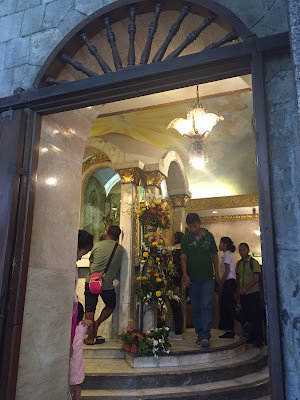 We then walked thorugh the next block to get to Cebu Metropolitan Cathedral. Along the way, we passed by a street filled with variety of Cebu delicacies and souvenirs for sale. There were also stalls selling Santo Niño de Cebu statues and other religious articles. The Santo Niño de Cebu is a Roman Catholic title of a statue of the Child Jesus in Cebu City. Many Filipino Catholic devotees consider this as miraculous. A minute walk from the cathedral is the Cathedral Museum of Cebu in P. Burgos St.. It is known to be the ecclesiastical museum of the Roman CatholicArchdiocese of Cebu which houses regional church architecture and artifacts mostly from the Spanish colonial times. After that, we braced ourselves for an exciting Tartanilla ride. and headed to our destination, the 1730 Jesuit House (Museo de Parian sa Sugbo) located at Zulueta St. It is said to be the oldest dated house in the Philippines based on a low- relief bearing “Año 1730”. An ancient house, it is interestingly located within the compound of a warehouse/hardware. A lot of antique furnitures and old home equipment are displayed inside which hold so many interesting stories over the decades. We took a break from all the walking and picture-taking and had our afternoon snack at its dining room eating a classic Filipino combo of Puto maya (sticky rice) and ripe mango plus a sizzling hot cup of Sikwate (chocolate drink). Perfect! After the Cebu Heritage tour, we checked in at Quest Hotel at Archbishop Reyes Ave. just stone's throw away from Ayala Center Cebu. This was going to be our home for three days. We got two hours to have a quick rest, freshen up and settle our belongings. We needed to meet again at around 7pm to have dinner at Sugbo Mercado. It is made possible by the Cebu City Tourism Office led by Punky Oliverio.